From top left, clockwise: Not a purchase really, but a trade with a local artist, this rather leery looking ceramic head pot has tons of personality. I love its built-up textures and subtle coloring. | Wishing she would be beamed up, reluctant chair model, Inky, dresses up a molded fiberglass chair straight from the Starship Enterprise’s lunchroom. I can’t decide if I’ll leave it as-is or explore painting it. Found at Treasures n’ Stuff in Ontario. 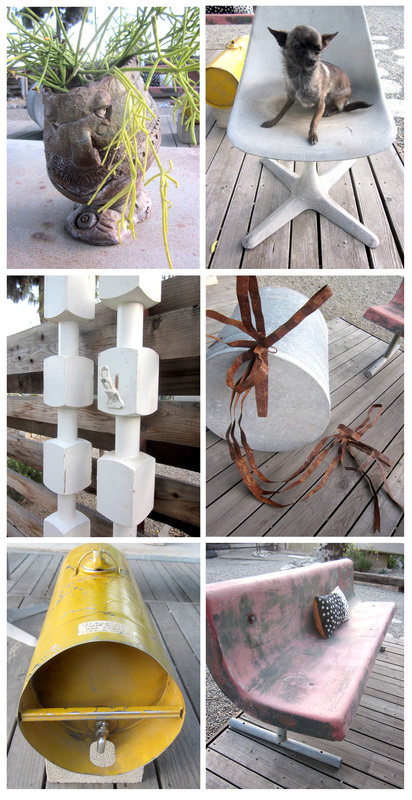 | Draped over a large galvanized container (complete with lid) is a rusted metal ribbon garland. Love the contrasting metals; container found in a Solana Beach antique mall, garland in an Orange Circle shop. 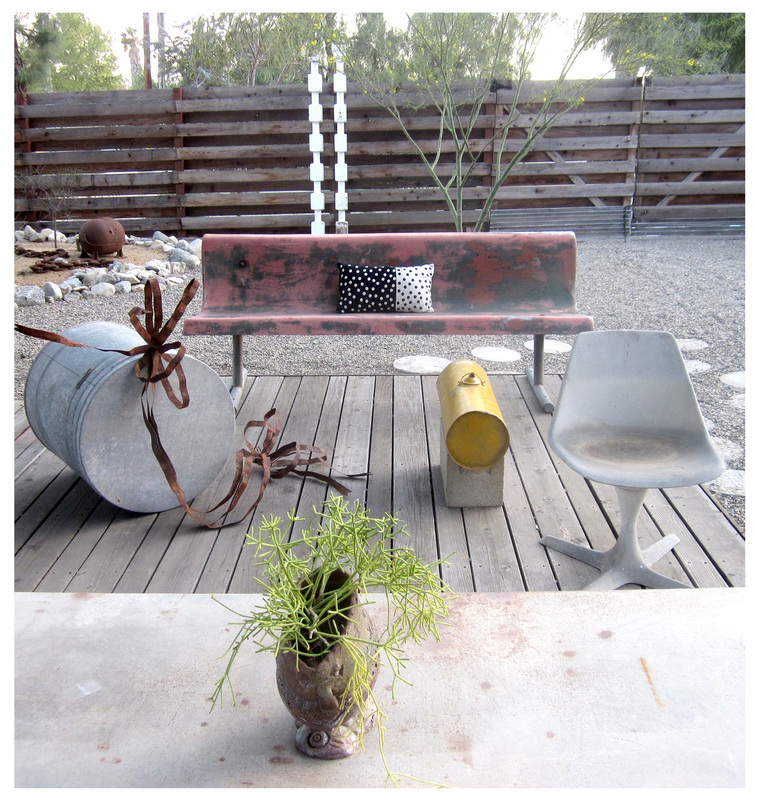 | Scoop-y and scrappy, this large fiberglass bench‘s red paint defines distressed. As with the Star Trek chair, it was found at Treasures n’ Junk, and may or may not be re-painted at some point. | Yellow painted metal cylinder is a clean-water dispenser, complete with a chrome spigot at one end. I doubt I’ll use it for its intended purpose, but upended it would make an interesting pedestal. From Solana Beach. | White-painted totems were someone’s porch supports in another life … what role they’ll play at the Rancho is yet to be determined. I got them in a local antique store. That makes you, me and Inky, Vickie … we’re all waiting to see what’s next! I’ve got to quit sending these so late at night when I’m mostly brain dead. Seems like I always miss on some of my spelling and drop words. Please consider source…. I’m loving the yellow thingy, the color is great. Plus, I can’t wait to see what becomes of the Rancho… I know it will be great. Coming soon … Isn’t Inky the picture of an aloof supermodel? Claws and all! Yes! How does she do it, aloof and stressed looking, all at the same time (smile). Like all models, the girl could use a sammich! I love that palette analogy … now I have to find the time and get to work!